Although dogs are able to digest grains, their bodies don’t break them down as efficiently as they do proteins and fats. 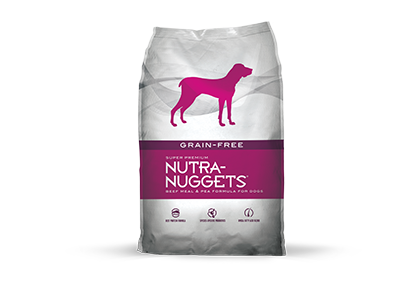 Nutra-Nuggets Grain-Free is specifically designed for dogs of all ages with grain sensitivities. Sweet potatoes and probiotics make each bite easily digestible, while high-quality protein helps dogs stay strong and active. Vegetables and fruits provide powerful antioxidants that work to support the immune system and an overall healthy lifestyle. Nutra-Nuggets Grain-Free delivers the real-meat flavor your dog craves and the complete nutrition he needs. Provides essential amino acids and the building blocks for strong muscles while delivering the superior taste dogs love. Live, active cultures of K9 Strain® Probiotics are in every cup of food to support healthy digestion and nutrient absorption. Omega-6 and omega-3 fatty acids support healthy skin and a shiny coat. Carbohydrates from sweet potatoes provide easily digestible energy. Ideal for pets sensitive to grains. Prebiotic fiber from dried chicory root provides nutrients to support the healthy bacteria in the intestines and helps optimize nutrient absorption. Guaranteed levels of zinc, selenium and vitamin E support a healthy immune system. Good for dogs from puppy to senior age.